For thousands of years, the lower Nile valley (northern end) has been a cradle of civilization. Surrounded by deserts, the Nile river brings much—needed water to the land and people, making the valley into an oasis of agriculture and life. In this true—color Terra MODIS image from August 23, 2003, the valley snakes in a green line from Lake Nasser in southern Egypt to the edge of the Mediterranean Sea, where it widens out into a vast delta. Quite appropriately, the valley resembles the lotus flower that is native to the region, is common in the imagery of ancient Egyptians, and is the national emblem of modern Egypt. Just at the apex of the delta is the ancient city of Cairo, which also serves as the nation´s modern capital. The city appears as a gray—brown spot sandwiched between the delta and the northern end of the Eastern Desert. 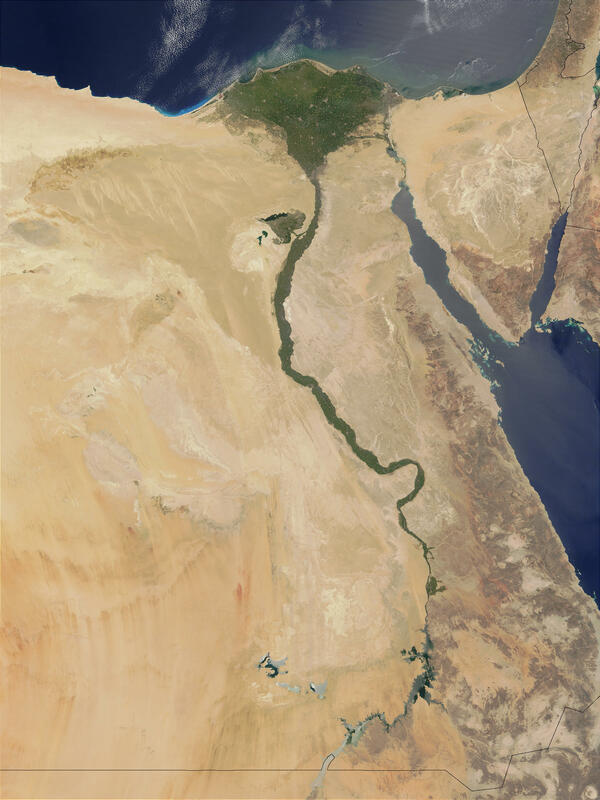 The leaf—shaped patch of green branching off of the western side of the Nile Valley is a depression in the Libyan Desert that has been used as an irrigated agricultural area since 1800 BC, when the original irrigation canals were dug. The depression is fertilized by the Nile´s water and silt.